Which Royal coins should I own? A collector’s guide. Births, deaths, weddings, christenings, jubilees, anniversaries and birthdays – The Royal Family have had commemorative coins issued to mark them all. No royal collection would be complete without a Princess Diana coin. 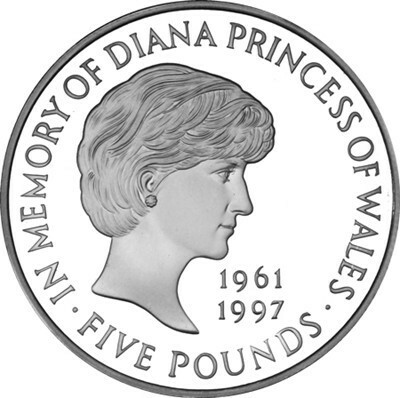 The most poignant issue was struck by The Royal Mint in 1999 following the tragic death of ‘the people’s princess’. Diana touched the hearts and lives of thousands across the globe and this coin commemorates her life – with a beautifully engraved portrait by David Cornell. Such an important member of the Royal family should forever be remembered and this is the perfect way in which to pay tribute to her life. The Prince Charles 50th Birthday coin holds the distinction of being the rarest UK Gold £5 coin to be issued. 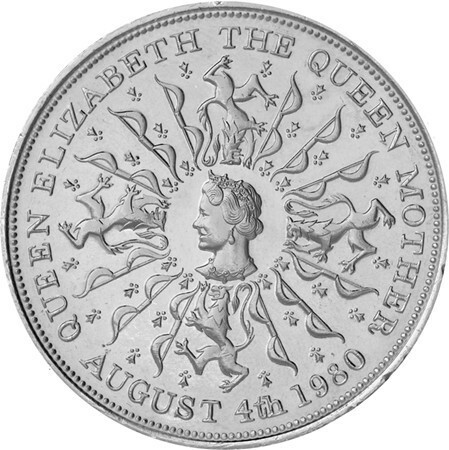 Just 773 were struck and it also features the most words of any British coin within its design. Prince Charles founded the Princes Trust in 1976 – a charity which was created in order to help the lives of disadvantaged young people. The coin was issued to celebrate his 50th birthday and honour his charity. As the longest serving heir in British history, Prince Charles is certainly a Royal figure that is certainly deserving of a commemorative coin. The Royal Wedding of the Duke and Duchess of Cambridge was viewed by an estimated 2 billion people around the world. 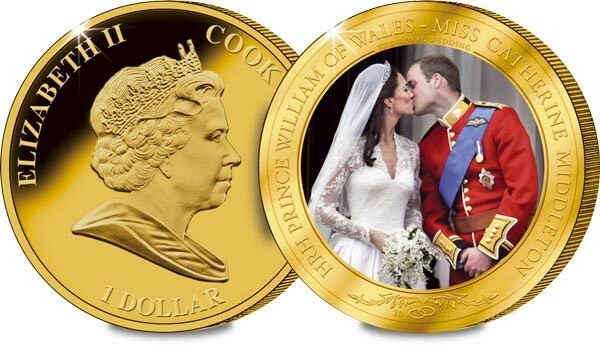 The most iconic photograph of the whole ceremony was undoubtedly The Balcony Kiss – and this was captured perfectly on this Cook Islands $1 coin. Plated in 24 carat gold the Royal Wedding Photographic coin had an edition limit of just 24,500 – which isn’t many considering the number of people who tuned in to watch the ceremony. In years to come when William is King, those who have this coin will own a lasting memory of the day he married his Queen. Born 22nd July, 2013, the arrival of the young Prince George stirred global interest – especially from the USA. As the first son of the Duke and Duchess of Cambridge, Prince George became third in line to the throne and is our future King. The Perth Mint issued a Royal commemorative coin which really stood out. 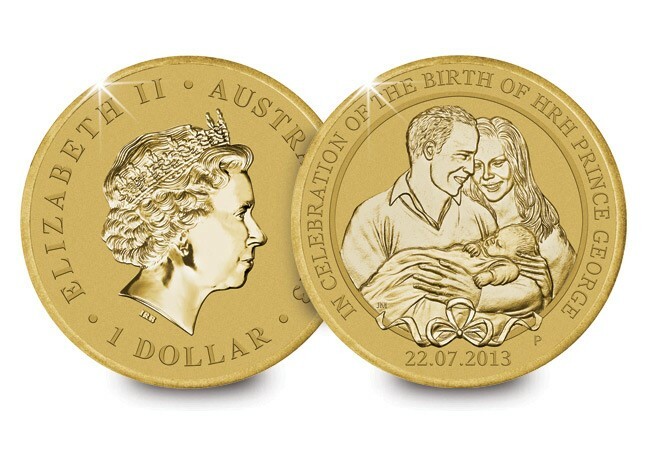 Depicting William and Kate with the new-born Prince this was the first official coin from a major nation to feature an engraving of Prince George. On 2nd May this year, the Duke and Duchess of Cambridge welcomed their second child into the world – Princess Charlotte Elizabeth Diana. The Royal christening took place on 5th July at St Mary Magdalene church on the Sandringham estate. 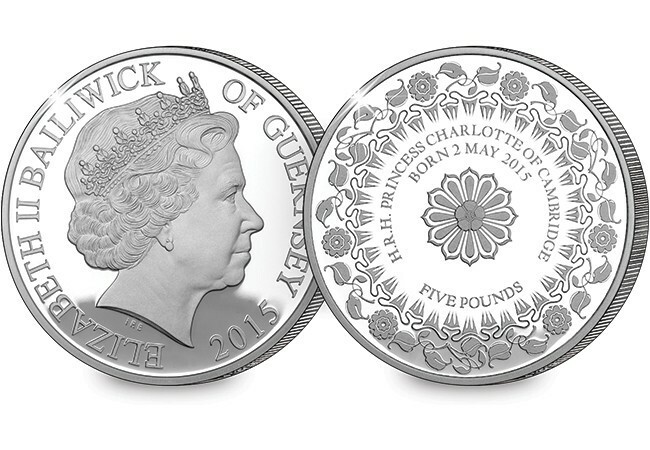 With a design inspired by the stunning Lily Font which is used for Royal christenings, the Silver Proof £5 Coin issued by Guernsey captured the moment perfectly. 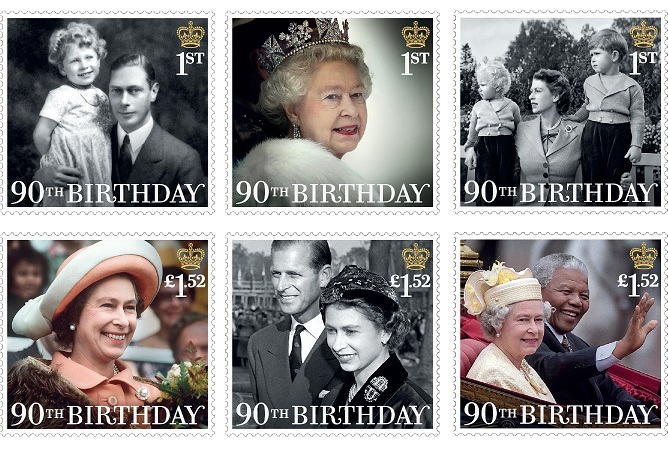 The elaborate one-off design makes this one of the premier commemoratives celebrating the young Princess. In 2012 Her Majesty Queen Elizabeth II celebrated her Diamond Jubilee. It was a multinational celebration that marked the 60th anniversary of the her accession in 1952. To celebrate, an exceptional ‘double obverse’ coin was issued. 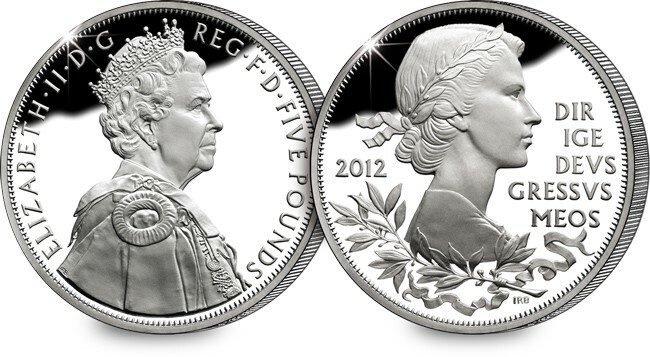 The coin is the first ever UK crown to feature the Queen’s full profile on both sides. With such a rare design, the Diamond Jubilee coin is certainly one which adds another dimension to any Royal collection. Prince Philip’s life of Royal service began at Queen Elizabeth II’s accession in 1952 when he was promoted to Commander after a distinguished career in the Royal Navy. 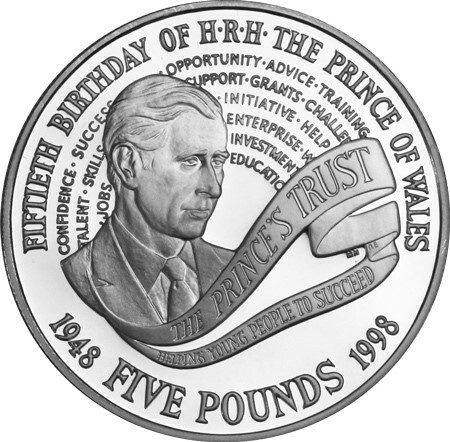 To mark his 90th birthday in 2011, a specially commissioned portrait was struck on a £5 coin issued by the Royal Mint. This was the first coin in British history to feature both a Monarch and a Consort on opposite sides. This was the penultimate 25p crown issued in the UK and was the first ever British coin to feature a living person other than the reigning monarch. 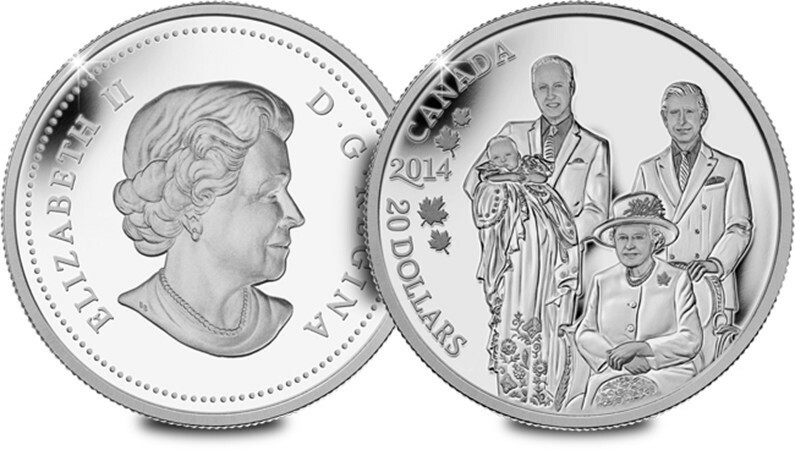 A special mention goes to the Canada 2014 $20 ‘Royal Generations’ Silver Proof Coin. This coin was issued to commemorate the birth of Prince George and pictures three generations of heirs. I think it’s particularly special as Prince George’s birth marks only the second time in history that Britain has had three living male heirs to the throne from separate generations – and this coin captures them all.